It was May 4, 2010, when I received trial unit of Nokia E72 from @womworldnokia and then my first request to Womworld was to send it in white, which seems much royal to me then. But I didn’t got a sneak peak of same as it was available in selected regions only. 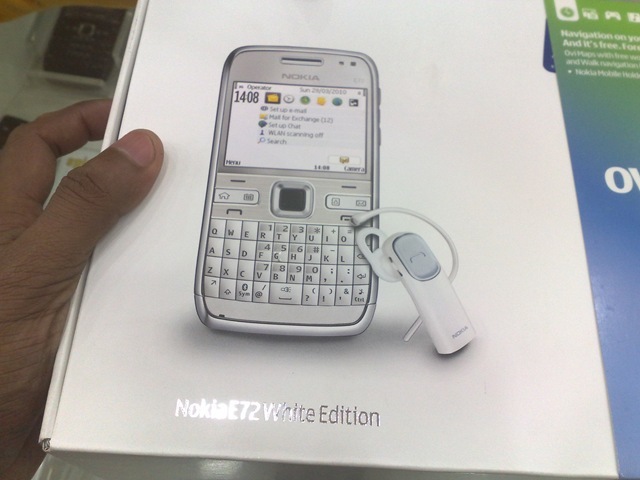 But now the wait is over, just spotted Nokia E72 White edition in New Delhi at Spice Hotspot by today only. As it was a packed device, I wasn’t able to take more snaps, so taken just one. As you can see, the package contain Ovi Navigation accessories as my Nokia E52 contained and an exclusive offer of matching white Bluetooth headset BH-216. The price is 1k above than normal Chrome or Black Nokia E72, which stands as Rs. 17, 500/- in place of normal Rs.16, 500/-. The Hotspot guy told me that stock is limited and could run out anytime. Anyone interested? Yup it’s been in the market for about 2 weeks now 🙂 Everyone seems to love it. I loved it, but paying 1k more for a cheaper Bluetooth Headset annoyed me. 6 hrs talk time for BH-216 is a big let down. Wish they would have went for BH-212 or anything else with 10 hrs. also, does it have a phone lock code where you have to input a code before it unlocks? Phone lock code is possible with all Nokia phone and as about.message view then I guess you talking about conversation mode, its not here by default but I think there are apps that could give you same functionality.